Lomond River Lodge and campground near Lomond River, on the boundary of Gros Morne National Park offers unparalleled fishing opportunities for Atlantic Salmon. The abundance of Atlantic Salmon Pools on this river provides fisher persons with a choice, and if fishing is not great in one pool you may move a short distance to the next. There are many trails to and from the different pools which makes each pool easily accessible. We will provide a map that indicates the location of several Atlantic Salmon Pools located along the The Lomond River. 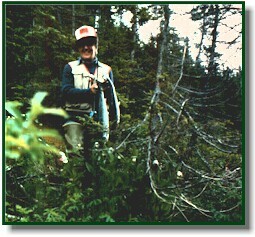 This area is world renown for its abundance of Atlantic Salmon. Fishing for this species provides an exceptional challenge to both the professional and novice fisher person. Here at Lomond River Lodge and Campground, we provide the accommodations and will arrange guide services, facilities and supplies to provide you with a dream fishing vacation. We are located on the boundary of Gros Morne National Park and our guest enjoy some the most beautiful scenery in Canada as they cast a line to fish for Atlantic Salmon. Your fishing experience can be customized to include a truly remarkable boat tour, hiking expedition or sight-seeing tour in Gros Morne National Park. Fishing Packages to Lomond River Lodge and Campground are available upon request.